Jim Carrey is up for honor at the 2010 Nickelodeon Kids' Choice Awards next month. Again this year he is nominated in the category 'Favorite Voice from an Animated Movie' and A Christmas Carol is also among the nominees in the 'Favorite Animated Movie' category. The Kids' Choice Awards will air March 27 at 8/7c on Nick. Voting starts February 25! 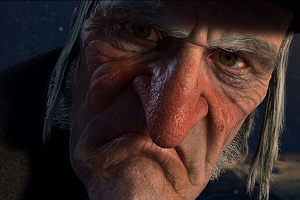 Doing a voice for animation doesn't let Jim Carrey use his famous rubber face, but that just means he's got to step up his voice acting, which is exactly what he did in "A Christmas Carol". Playing the voice of not only Ebenezer Scrooge, in young and old versions, but also a couple Christmas ghosts, Carrey did it all in this classic holiday tale. Nick fans are well aware of Jim Carrey, having already won 5 Blimps for his work in Bruce Almighty, How the Grinch Stole Christmas, Ace Ventura, and more. Maybe he's got room on that shelf for one more? -- Source: KCA. With thanks to Cotton. Click to comment this article.